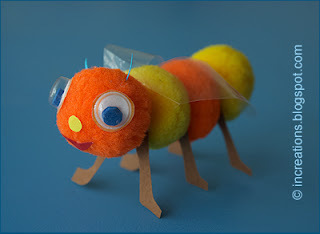 There's a simple technique for creating cute toy insects from pompoms. For example, for such a honeybee you will need pompoms, colored paper, and a wooden toothpick or cocktail stick. A pair of legs, the wings and the last pompom for the head. You can watch the process in my video tutorial How to make a bee toy using pompoms and a toothpick. If you have a problem viewing this video on YouTube, it's available also via Vimeo. Wiggly eyes can be easily made from an empty blister pack: put a small black paper circle into a blister and seal it with glue and a round piece of paper. Here are other insects that were made using the same technique: a spider, an ant, and a dragonfly. 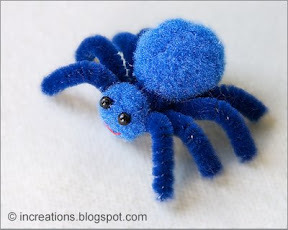 For a spider take two pompoms of two different sizes, push one end of a toothpick into the smaller pompom (put some glue on the toothpick beforehand). Wind four pieces of pipe cleaner around the toothpick for the legs. Then, thread the larger pompom onto the toothpick and remove its protruding end if needed. Finally, attach a pair of eyes and mouth cut out of paper. 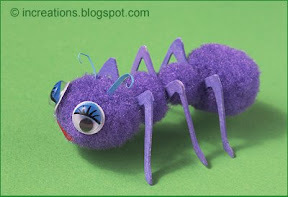 An ant can also be made using a toothpick, four pompoms, paper legs and wiggly eyes. Just cut out three M-shaped pairs of legs and thread them between the pompoms onto the toothpick. Apply some glue onto the toothpick as you go to hold the parts in place. Attach the wiggly eyes, a paper mouth and antennae to create a cute face. 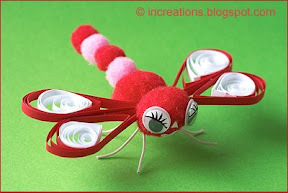 The dragonfly is a combination of the pompom technique and paper quilling. 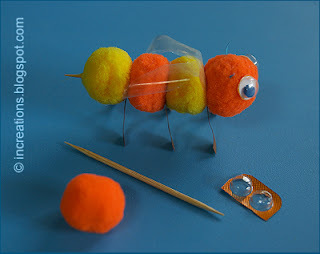 For this simple project you'll need a toothpick (cocktail stick), pompoms of different sizes, a peace of wire for the legs, wiggly eyes, and red and white quilling strips. Assemble the dragonfly by threading the pompoms and wire legs onto the toothpick. To create a wing, join a red and white quilling strips together, roll them so that the white part goes inside, then shape a quilling "teardrop". Make all four wings using this method and attach them to the body. Glue the eyes, mouth and nose onto the head. For those who don't know, Mike Wazowski is a character from "Monsters, Inc.". He's not an insect, but a very cute and funny one-eyed monster. In any case, he can be made using pompoms, too. 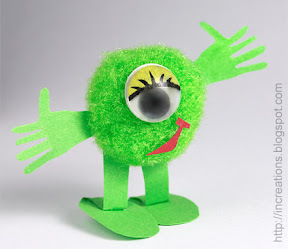 You will need only one pompom, one wiggly eye and some construction paper. Super cute insects! Nice video instructions!